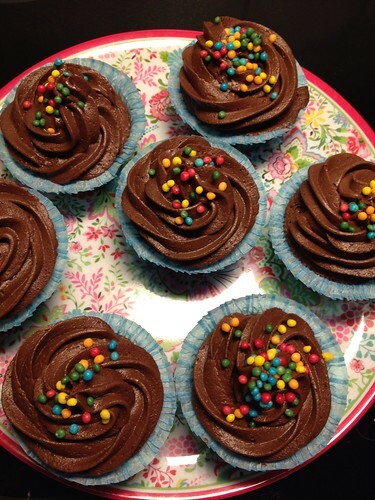 Cupcakes are all the rage - or are they over already? I can't tell. It's not something I usually make, nor do I enjoy them all that much. However, I was sent a boxed mix for chocolate cupcakes by Kungsörnen and on a rainy afternoon, it was the perfect project to do with my three-year old. It really couldn't be simpler - stir bag A with water, dollop into the provided paper cups, bake. Letting them cool was probably our largest problem. Next, mix bag 2 with softened butter and a little water, and in my case, I added a little cream to make it more pipe-able. Pipe or spread onto the cooled cakes. Then take bag 3, which contains sprinkles, and decorate as you (or your kid) see fit. They turned out pretty good. Surprised me, actually. Very sweet, but also very chocolatey and they kept well in the fridge for a few days. I think we got nine in total. The cupcakes look really delicious!